Tilak holds B.Sc and D.Phil. degrees in mathematics from University College London and University of Oxford. His thesis research in computational fluid dynamics was followed by postdoctoral research in asymptotic methods in boundary layer separation in thermal flows at City University London. A chance meeting led Tilak to work with Bill Brownell at the Dept of Otolaryngology-Head & Neck Surgery at the Johns Hopkins University School of Medicine in 1991. In 1994 he continued his work on cochlear outer hair cell mechanics with Sasha Popel in the Dept of Biomedical Engineering. In 1998, Tilak joined Michael Miller at the Center for Imaging Science. Current research interests include a) shape analysis of brain structures including hippocampus, cingulate gyrus, planum temporale, superior temporal gyrus, auditory cortex and prefrontal cortex which are implicated in neuropsychiatric and neurodevelopmental disorders such as schizophrenia, Alzheimer’s, epilepsy, depression, speech and language processing, b) physiological fluid mechanics of the cochlear outer hair cell, c) nonlinear partial differential equations e.g. EPDiff in Computational Anatomy, Webster’s Equation in bioacoustics, boundary layer separation in physiological flows, d) mobile and web applications for auditory training for people with hearing loss using cochlear implants and/or hearing aids, e) online webcourses in applied mathematics. Deafness or sensorineural hearing loss results in degraded or limited transmission of information to the primary and secondary auditory cortices and association cortices in the brain from the damaged or dysfunctional cochleae. Such sensory deprivation results in a brain that is structurally different from those in the general population. The degree of difference is likely to be related to the degree of hearing loss as well as plasticity induced by the adaptation to auditory stimuli provided by a hearing aid or a cochlear implant and visual stimuli such as that provided by lipreading (or speechreading). In addition, differences can accrue from compensatory cognitive strategies. Thus the deafened brain has been both an attractive and challenging target of neuroimaging studies since the turn of the new millennium. Many of these studies have focused on functional activity but relatively few have looked at structural characteristics. Following a brief review of these structural studies, we then describe results applying the Labelled Cortical Distance Mapping (LCDM) technique in two separate structural imaging studies of deaf adults and deaf babies. 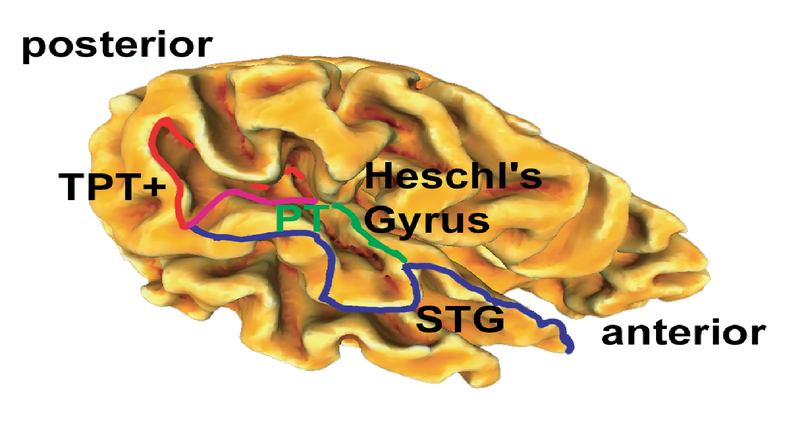 Results suggest that LCDMs provide a different and intuitive way of viewing anatomical changes in the auditory cortex in babies and adults with and without hearing loss.